Di-Astrum LED lighting offers a huge range of both indoor and outdoor lighting products for any LED project. The high-quality, long-lasting products are available at affordable prices, providing you with long-term financial benefits with a quick ROI. 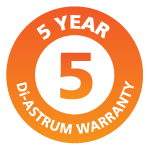 All of our Di-Astrum LED lights come with a full 5-year warranty for your peace of mind. Please Note: Early lamp failures can be expected but are less than 1% and will be covered within the terms of your warranty. If you have any questions with regards to our warranties, please contact us for more information. Estimate the savings and payback for your own projects using our Payback Calculator. This tool allows you to customize costs to your specific operations while calculating up to three different lighting applications together in one project estimate. All of our products come with the IP rating required for your application, including IP20, IP44, IP45, IP65, IP66 and IP67. Save energy when full lighting is not needed. Dim the lights to 50% to save 50% of the energy. Use PIR control for extra security and further engery savings. Usage only required when application is in use. No need for 24/7 lighting, allowing not only energy saving but also extending the LED lifespan. By using less power than conventional lighting means your carbon emissions is also reduced. Ideal for refrigerated areas, chiller, freezers etc. Safer than conventional lights and ideal for C.C.T.V. providing higher definition and illumination. Achieves full light intensity in a fraction of a second even at very low temperatures, no re-strike time delay, ideal as safety lights that can be triggered by an occupancy sensor. 125W LED can replace up to 400W conventional light source – Energy savings of up to 70% if in use 24/7 and even more if switched off or dimmed. Cuts light spill and means fewer fixtures are needed resulting in reduced capital and energy costs with improved light uniformity. Let us help you get started with your LED Lighting project. Book an appointment for us to carry out a site survey and we'll bring some sample units so you can see the superior light quality for yourselves.